Full-Time Blues Radio is an hour-long, weekly radio show that specializes in new and independent Blues music from around the world. You will never hear the same song twice on this program, although a new album may be worthy of having several songs featured over time. Are you a radio programmer looking to offer the best in Blues to your listeners? Become An Affiliate! Full-Time Blues Radio is Distributed by Public Radio Exchange. “Johnny Full-Time” is your host. A veteran of the broadcasting industry for over 10 years, John has spent his career working on-air and behind the scenes in both radio and television. He began hosting this show in June of 2008, and has painstakingly crafted Full-Time Blues Radio into a respected destination for artists to be heard and fans to hear amazing music. The show is praised for its diverse playlists and the respectful knowledge with which the host presents the music. Click Here to see which stations air the program on the radio. If we’re not on in your area, please contact your favorite station and tell them you want to hear Full-Time Blues Radio! As a part of our commitment to the best new Blues, you’ll hear a weekly segment spotlighting a brand new arrival inside “Johnny’s Mailbox.” Our occasional segment, “The Vinyl Report,” brings you news about Blues on wax. You’ll also hear artists pop by the program for an interview or performance from time to time. And, Full-Time Blues Radio is home to some of the best themed episodes in the industry, devoting entire hours to acoustic music, harmonica Blues, Spirituals, and many more. Word of mouth is the best advertising. If you like what you hear, please tell the other Blues lovers in your life to listen to the program and to bookmark this website. There is a cost associated with offering these episodes for free streaming each week. You can help offset those costs in a variety of ways. Show your support with a Full-Time Blues Radio t-shirt! Are you doing any online shopping? 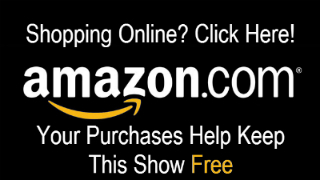 Please click our Amazon banner on your right. You’ll go to the same Amazon site you’ve known for years, but we will receive a small referral payment from Amazon for sending you their way. It doesn’t affect your prices, and it is a secure connection. Thank you for Keeping The Blues Alive!